The Jesuit Missions of Bolivia: I bumped into a fellow expat in the main square in Concepción. We were both thinking the same thing – why don’t more people come here? I really have no idea though maybe I am a good example of this reticence. I have been coming and going from Santa Cruz for nearly a year now and I have only just visited. Maybe people are put off by the potential distance, or the unknown, or a fear that as they aren’t deeply religious or particularly interested in architecture or history they will not be able to appreciate these places. Jesuit Missions of Bolivia Slideshow: BoliviaBella.com’s trip was created by TripAdvisor. Create your own stunning slideshow with our free photo slideshow maker. None of the previous sentences apply to me yet I can honestly say that I think Concepción is one of the nicest places I have ever visited and will be looking for an excuse to go back. 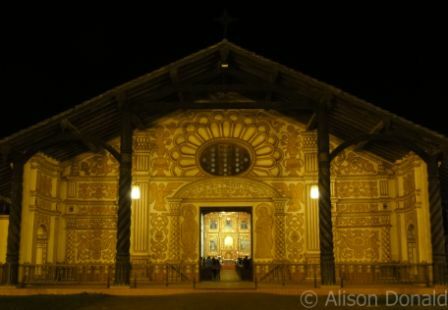 The Jesuit Mission towns in Bolivia are unique as the only remaining living Mission towns in South America. 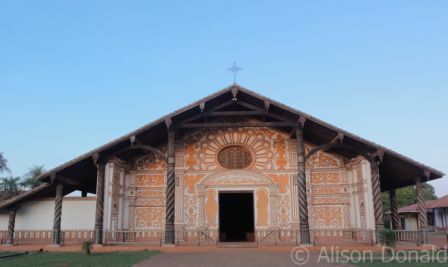 When you also consider that these beautiful churches have been painstakingly restored and that each has a compelling setting in what is basically the jungle, it is a real shame how few people include the Mission towns in their itinerary. However, this may be to the benefit of those who do make the journey out here. Instead of being jaded by tourism, the villagers are very friendly and welcoming and certainly Concepción is a very safe place for outsiders. It is generally suggested that people wishing to visit the Jesuit Missions independently allow around a week to do so (the full tour circuit includes seven Jesuit Mission towns). However Concepción and San Javier are the closest to Santa Cruz and can easily be visited on an overnight or two-night trip. Bus company Linea 102 TransGuarayos has 6 departures per day from Santa Cruz (basically at the back of the bus station – get there via one of the tunnels from the main ticket vending areas) to Concepción via San Javier. You should allow around 5-6 hours to Concepción and over 4 to San Javier. I turned up at 1pm on Saturday lunchtime and was lucky to find that a bus was departing shortly and there were still seats (but only two) available. From the outside the bus looked in surprisingly good condition though once inside I realised that it had already had one life in Brazil (the signs above the seats were in Portuguese). It had undergone some Bolivian modifications – there were no screws to hold the television in place on the hanger so instead it had been “secured” with sticky tape. Also the toilet had been taken out, making room for 3 extra seats and eliminating the need to clean it. Who needs to use the toilet on a bus journey of 6 hours anyway? We made slow progress out of the city limits and I closed my eyes and ears to the salesman who had been allowed on board the bus and who gave us an hour-long talk on the dangers of obesity and how to combat it (with his Chinese tea, of course). Food and drink made its way onto the bus as we stopped at tollbooths as either the sellers boarded or it was handed through the window. I’m sorry to say that the waste (plastic bags and bottles) made its way back out through the windows. The dusty villages became fewer and further between until the road basically cut through the jungle. Darkness fell and the only forms of outside light came from fireflies and a wonderful display of stars. The final stop in Concepción was the bus office, 3 blocks from the main plaza. The older part of the village was very very quiet though as I made my way to my hotel I was reassured that many householders had left their front door open as they sat inside and watched TV. On arrival at my hotel “ApartHotel Las Misiones” I was very glad that I had chosen it and made my reservation in advance. The location is perfect, the common areas full of family pictures and heirlooms and the staff with genuine smiles. I checked in then left the hotel to explore. It was early Saturday evening and the church was full of worshippers and the plaza full of teenagers. Planning restrictions in Concepción mean that business should only display their name on a carved wooden board and this made it a bit harder to indentify somewhere to eat. I did a full lap of the plaza before I came across the only restaurant – Buen Gusto. There is a huge outside courtyard and all meals allow a trip to the salad table, laden with inventive and fresh-tasting dishes. 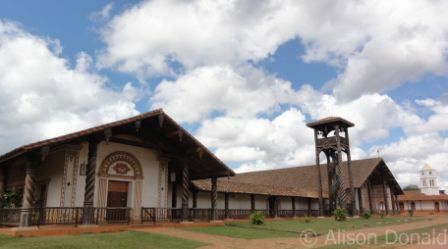 Click here to see a listing of more restaurants in the Jesuit Missions of Bolivia. After mass the church doors remained open and I was free to wander and take all pictures I wanted (without flash). As you can probably imagine, there is not a great deal to do in Concepción after nightfall (though there is a nightclub) and night owls should prepare themselves for this. The fresh air from a 6 hour bus journey with open windows ensured I was to fall asleep quickly and soundly. Breakfast was not to disappoint. The table was laden with fresh fruit juices, fruit salad and freshly baked goods and my only regret was that I had not gotten up earlier and given me more time with this breakfast feast. Most tables were occupied and I would expect that the hotel had been almost full the previous night. The bell for mass rang at 8:45am and someone at another table made a joke about how they should be getting going to Church. Everyone laughed and stayed in their seats. The church museum was supposed to open at 10am however it remained closed as the employee on duty did not show up. 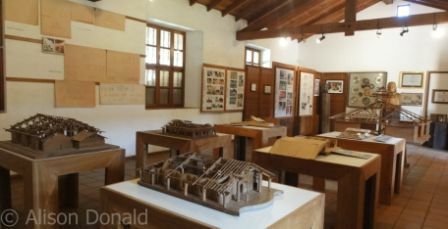 I spent the time instead in Museo Misional (also on the plaza) which tells the story of the restorations of the churches, the life of Hans Roth [the architect behind the restorations] and also contains many original artefacts salvaged from the original churches. The combined entrance to both museums is 25Bs (around US$3.50) and I would recommend you allow at least 3 hours for both. There is a great deal of material and again you can take all the photos you want. I was keen to see the church museum as well and so I opted for another night in Concepción. I found a typical lunch in the market and then spent the afternoon strolling around the village. Crime is almost unheard of here and I was assured that I could wander around the village and the surrounding areas without any fear for my personal safety or belongings. The residents here are very friendly and you will find that you keep bumping into the same people. Away from the smart square and surrounding streets, many people live very simply in small adobe cottages or wooden shacks with thatched roofs. Click here to read the history of the Jesuit Missions of Bolivia and here to read more about what life was like when the Jesuit Missions of Bolivia were first established. It was here in Concepción that I realised autumn was upon us. The longest day here is about 13 hours and the shortest day about 11 hours so the slightly shorter daylight hours creep up on you. The sun is no longer still scorching at 4pm and it seems to set more gently. In Santa Cruz we’d had the first cold winds from the South however most of the foliage in the city is evergreen and I think I must have been in denial. Here in Concepción there were plenty of bare trees and dry leaves swirling in the streets. I kept my fellow expat company as he waited patiently for a perfect photo - the sun needed to set to a certain level or to be intercepted by a cloud to avoid any hint of shadow on the beautiful church front. At dusk there were plenty of people in the plaza and we discussed when street lights might be turned on. We had failed to realise that the virtually the only lights around were those from vehicles. Power cuts are pretty inconvenient at the best of times but when you are in an unfamiliar place and have failed to bring a torch (flashlight), life becomes a bit trickier. Luckily my hotel had lights in the entrance area though away from this I used my mobile phone as an impromptu lamp. I didn’t make it far for dinner – in fact back to Buen Gusto where I had been the night before. They were lighting and cooking by candlelight. Around 7:20pm the fridges hummed back to life and the low-energy light bulbs gathered strength. The church museum doors were open on Monday morning and I was very glad I had waited to visit. There is a very worthwhile selection of photos of the history of the church and its place in the community, though commentary in Spanish. Also there is a small selection of books and pamphlets (in Spanish) for sale, CDs of Baroque music and actually really beautiful and good quality postcards. When the church doors are closed (eg outside of the weekend), this is how you access the church and courtyard. I left Concepción on the 10:30am bus, my only thought being when I could come back to visit again. San Javier (sometimes written as San Xavier) does not enjoy the same tranquillity as Concepción though some may find it a more appealing place to stay for this reason. Perhaps because of the lay of the land, the road next to the church has become the main thorough fare on the way to Concepción and also handles most local traffic. Lodgings and places to eat in San Javier are more obvious – strung out along the main road or around the square. There is also light industry in San Javier – the town gives its name to a brand of cheese sold all over the Santa Cruz region. There are also smaller artisanal cheese producers – look for the signs in front of the properties. I arrived at the doors of the church museum to find it (and therefore access to the church) closed. This time it was my fault however as unbeknown to me, the museum is always closed on Mondays. The Padre, a jovial Polish man, was heading towards the church whilst I was scrawling in my notepad the opening times of the museum. He asked me if I would like to go inside the church and as we walked towards the huge door he told me of his plans to stop the pigeons roosting in the eaves of the church and his (correct) prediction of who would win the Champions League Final. I entered just as it was starting to rain and was left alone in the beautiful church to take all the pictures I wanted. Padre – on the very slim chance that you are reading this - I want you to know that I put 20Bs in the box at the back left of the church in lieu of the museum entrance fee. Santa Cruz to Concepción (all stop in San Javier and other locations in between on request): 7:30am, 10am, 1:30pm, 4:30pm, 7.30pm, 8pm. The fare is 35Bs. Trufis (shared taxis) make the journey more quickly and some are the same price as the bus or only slightly more expensive but you will have to wait for one to fill up. You are also more at the mercy of the individual driver, his liking for speed and how many people he wants to fit in the car. On Sundays (and Saturdays if you are at all pressed for time) you would be advised to book your ticket in advance. Before taking any lodging anywhere and handing over payment, always ask to see the room and check the airconditioning or fan works and that there is running water with adequate pressure. This is especially true of places such as the Mission towns, where people tend to pass through quickly and never return. Don’t expect anyone to speak English. Most of the lodging is to be found between the bus offices and the main plaza. If you accessed this article from our June 2011 Bella News Ezine click here to return. Want to add a page about the Jesuit Missions to our site?